thanks, recommended it to a new Chrysler owner and he couldn't join. I imagine there are a lot more that would like to join. This has been ongoing for a year or so. Can something be done about it please? If not, this site is going to slowly fade away. Can a statement be placed on the homepage where guests could request to join. 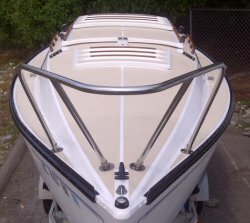 The admin over at http://beneteau235.com/forum/ has the same problem with his PHPBB system. He asks visitors to go to a specific page where they can see an email address (on a graphic so that bots can't pickup the email and spam it). Visitors email him at gmail.com and he manually adds the account into PHPBB. Not sure what is up with PHPBB, but this is obviously a problem elsewhere. Reality wrote: thanks, recommended it to a new Chrysler owner and he couldn't join. We're working on an upgrade/facelift now. Won't be much longer for owners to join. Please have your friend check in soon. thanks for your work. I've recommended a couple times lately and told them to keep trying to join. I still have my mutineer (we call it the 'Mutt'). when water levels are low I bring the Mac home.